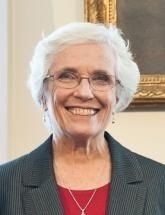 Jehlen previously served as state representative and on the Somerville School Committee. While on the school committee, she helped launch the Council for Fair School Finance. The council brought the lawsuit which led to 1993 ed reform commitments to more, and more equalizing, state aid to all communities. As Senate chair of the Committee on Elder Affairs, she is working to ensure that seniors have a choice of settings that meet their needs so that they can age in their communities. This year she is co-chair of commissions on Elder Economic Security, Protective Services, and LGBT Aging. She has worked for adequate funding for adult day health and home care services, and this year led the successful effort to give home care workers, who make an average of $10 an hour, their first raise in 6 years. Jehlen is Senate vice-chair of the Committee on Education and was appointed to the Foundation Budget Review Commission, where she continues to work on issues of fair and adequate school finance. She is also working to reduce the over-reliance on standardized testing to judge schools, districts, and teachers. She chairs the Mystic River Caucus, which this year secured funding for the next stage of the Mystic River Master Plan and the removal of invasive weeds in the river. Legislators in the caucus also successfully advocated for funds for many projects for flood control and water quality improvement. Previously Jehlen worked as a VISTA volunteer and teacher. She lives in Somerville with her husband, daughter, and two granddaughters. Their two sons and their wives live in Somerville and NYC. Jehlen was elected senator for the 2nd Middlesex District in 2005. She represents all of Somerville and Medford, and parts of Cambridge and Winchester.